The Davis Barrier Boot is a affordable temporary replacement for a lost horse shoe. The horse boots will protects the tender frog and sole. They allows the horse to walk unshod, protecting the hoof from cracks and chips. The simple pull-on fit allows for easy application in the field without tools. The Barrier Boot stays secure with a strong nylon adjustable strap without damaging the hoof wall. 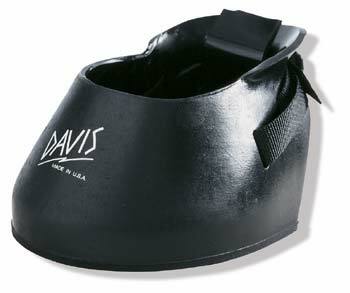 The Davis Barrier Boot is sized like a horse shoe. Please consult your farrier for the correct shoe size.